A draft of the nine proposed projects in the new IMP. 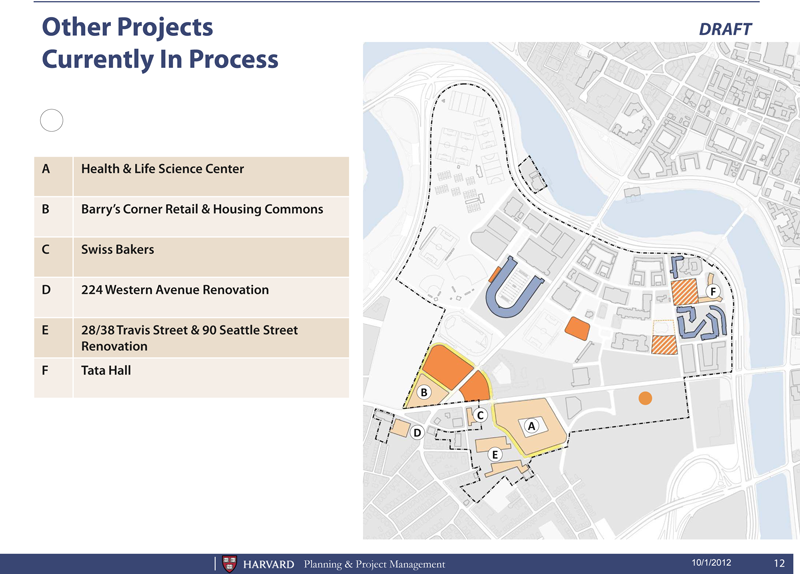 The new outline does not include the Health and Life Sciences Center, slated for groundbreaking in 2014, nor the Barry’s Corner Housing/Retail Commons slated for groundbreaking in 2013 with plans to open the following year—both were approved under the previous IMP. The ten year plan for Barry's Corner includes various spaces with active ground floor uses. After 18 months of planning and community discussions, the University unveiled a new 10-year Institutional Master Plan Notification Form (IMPNF) at the Harvard-Allston task force meeting on October 11, enumerating projects that administrators deemed to have a “major transformative” effect on Harvard’s expanding campus. 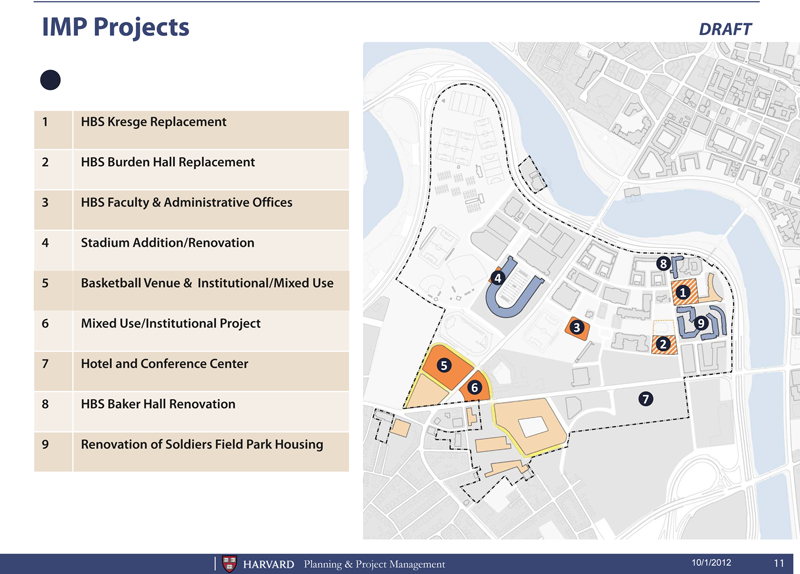 University speakers outlined nine major projects that will fall under the new IMPNF, including an addition to Harvard Stadium, a brand-new basketball gymnasium that will be built between 2017 and 2022, a hotel/conference center, and various renovations to building on the Harvard Business School (HBS) campus. Soldiers Field Park Housing Renovation, a housing complex located adjacent to HBS, planned for sometime between 2017 and 2022 (423,000 square feet, three to nine stories high). The new outline does not include the Health and Life Sciences Center (already approved under the previous IMP), slated for groundbreaking in 2014, nor the Barry’s Corner Housing/Retail Commons, slated for groundbreaking in 2013 with plans to open the following year, which is still in the permitting process. 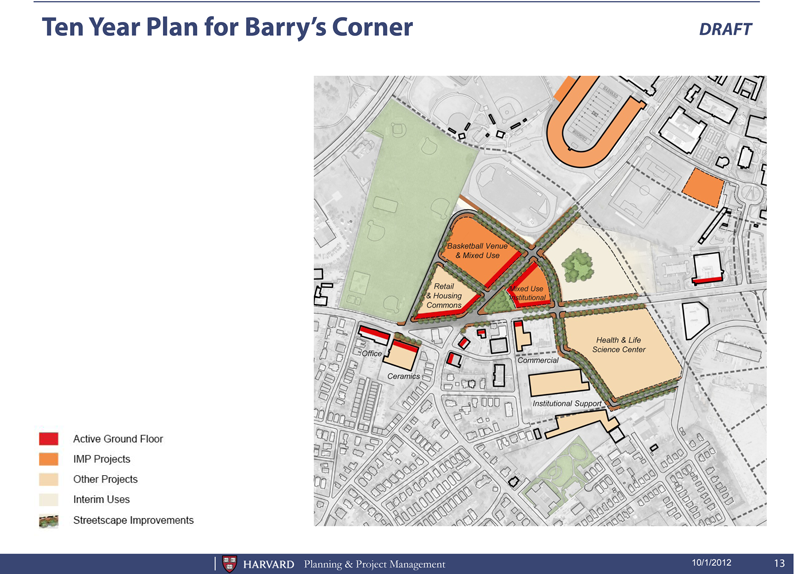 Harris Band stressed that the new projects would be complementary to the University’s aspirations for Barry’s Corner (at North Harvard Street and Western Avenue). “We will be working very hard in our planning to make sure the ground plan, pathways, and streets work to connect these projects effectively to Barry’s Corner so that it is an intuitive connection,” he said. The University is expected to file the IMPNF formally with the City of Boston next week. The community then has 30 days to give feedback before Harvard resubmits the plan to the Boston Redevelopment Authority. After a 60-day comment period, the BRA and the Boston Zoning Commission will decide whether or not approve the final IMP. See draft plans from the proposed IMP presented at an October 1 task-force meeting.